• For quantitative determination of total antioxidant capacity (TAC) and evaluation of drug effects on TAC metabolism. • An ANTIOXIDANT is a molecule capable of slowing or preventing the oxidation of other molecules. Antioxidants protect the cells from damages by reactive oxygen species which are produced in oxidation reactions in the cell. Antioxidants can be small molecules such as glutathione, vitamins, or macromolecules such as catalase, glutathione peroxidase. As oxidative stress contributes to the development of many diseases including Alzheimer’s disease, Parkinson’s disease, diabetes, rheumatoid arthritis and neurodegeneration, the use of antioxidants in pharmacology is intensively studied. Antioxidants are also widely used as dietary supplements and in industry as preservatives in food, cosmetics, rubber and gasoline. Simple, direct and high-throughput assays for total antioxidant capacity (TAC) find wide applications in research, food industry and drug discovery. 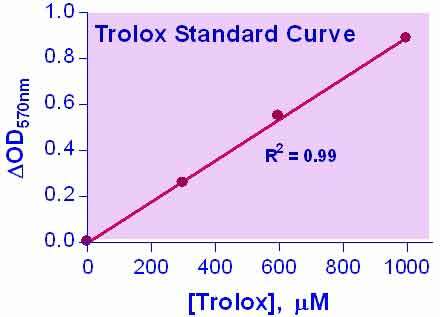 BioAssay Systems improved assay measures total antioxidant capacity in which Cu2+ is reduced by antioxidant to Cu+. The resulting Cu+ specifically forms a colored complex with a dye reagent. The color intensity at 570nm is proportional to TAC in the sample. 1. What substances are known to interfere with the antioxidant assay? Detergents, such as TWEEN-20, TRITON X-100, NP-40, should not be present at any concentration in the test sample. Reducing materials (DTT, 2-mercaptoethanol) and metal chelators (e.g. EDTA) may interfere with the assay. 2. How to determine TAC in tissue samples? Homogenize tissue samples on ice in cold 1xPBS (~100 mg of tissue/0.5 ml of buffer) and then centrifuge at 12,000g for 15 minutes at 4°C. Remove the supernatant and keep it on ice. For long term storage, store in working aliquots at –80°C.